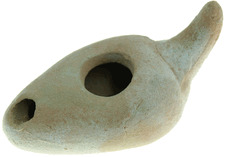 Canaanite Oil Lamp replica. Weight 100gr. Measurements 4.6 X 2.5 X 2.1 Inch. This very lamp reproduction was made in the mountains of Judah, in a reconstructed Biblical clay workshop located by the ancient city of Hebron. This Oil Lamp is aged Terra Cotta made, from the very same clay and methods were used for oil lamps production in the times of the Hasmoneans and earlier. Our Oil Lamps comes with two suitable wicks. It is ready to be filled with virgin Olive oil (Galilean Olive Oil will make the authentic experience complete). Lamps appear in the Torah and other Jewish sources as a symbol of “lighting” the way for the righteous, the wise, and for love and other positive values with positive spiritual meaning. In the time of the Bible, Oil Lamps were used for both domestic purposes and for many spiritual rituals in Synagogues and prayer gatherings. The oil lamp and its light also became important ritualistic articles with the further development of Jewish culture and its religion. “There I shall cause pride to sprout for David; I have prepared a lamp for my anointed.” (Psalms 132:16). “When you set the lamps, the seven lamps shall give light in front of the lamp stand (menorah).” (Numbers 8: 1 -4). “And you shall command the people of Israel that they bring to you pure beaten olive-oil for the light, that a lamp may be set to burn continually”. (Exodus 27:20). “A lamp is called a lamp, and the soul of man is called a lamp.” (Babylonian Talmud, Shabbat 30B). “For a commandment is a lamp and the Bible is light; and reproving discipline is the way of life.” (Proverbs 6:23). “A man’s soul is the lamp of God, which searches the chambers of one’s innards.” (Proverbs 20:27). Bring the Biblical Light and warmth into your home.